We customize a favorite proposal picture or wedding photograph with the couples wedding song lyrics or favorite poem digitally onto their photograph. I can also place the couples name/s and their wedding date onto this photo gift if you desire. We offer gift certificates! If you would like to purchase a gift certificate please call us directly at 302 892 2572 so that we can assist and provide you with a gift certificate coupon that has all of the important information needed and a photo description. When the designed photo gift is complete you will be sent a proof to review. The designer will allow 2 request changes, such as font style or size, or perhaps color. Any additional request change will cost an additional $7.50 per request. Once the proof is approved it will be professionally printed and placed into one of our high quality picture frames to complete the creation of this very special wedding gift. 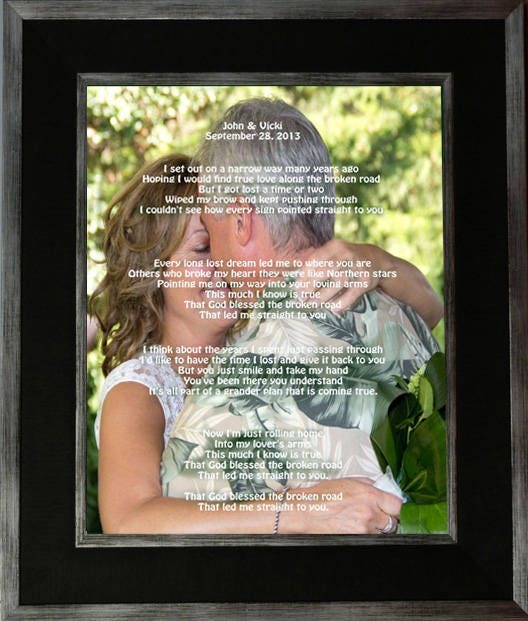 The framed photo gift can be placed on the walls of the happy couples first home together. Our framed photo gifts are made using high quality picture frames that can stand alone or be hung. All of the frame selections have velvet backings. All of our frames have the hardware attached to be hung. You can select the style you would like when placing your order. Regarding our turn around time: All customized gift orders will be received and processed Monday – Thursday. All orders received from Friday – Sunday will be received and processed on Monday. These are designed for you and it usually takes 7 - 10 business days to create and ship it out on your behalf. We will send you the tracking information once it has shipped.